I know I say this a lot but seriously, this pie, it’s pretty freaking amazing. I took one of my favorite childhood desserts and made it into a pie. 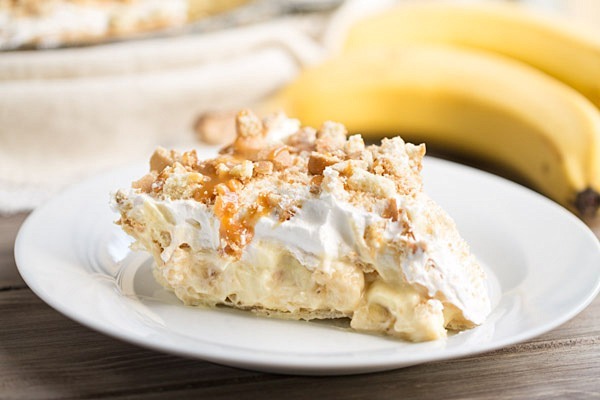 A flaky pie crust is filled with a mixture of vanilla pudding, Cool Whip, vanilla wafers and sliced bananas. 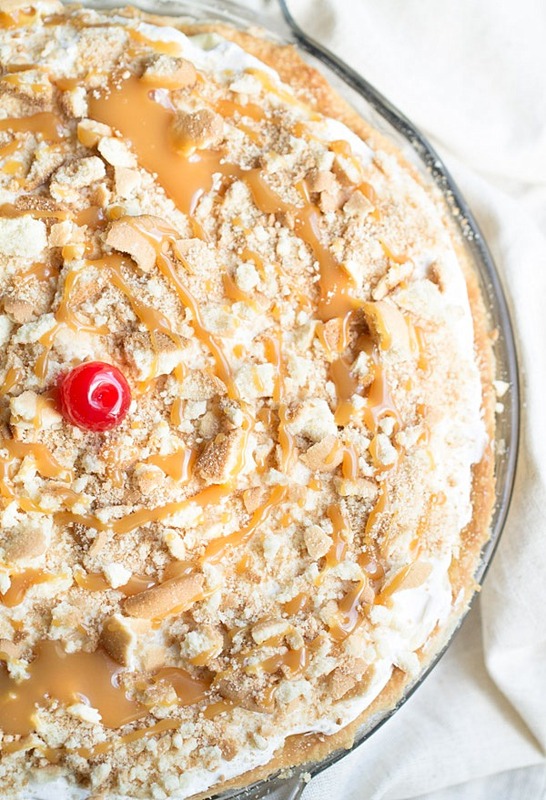 I topped it all off with more Cool Whip, crushed vanilla wafers and salted caramel sauce. I’ll give you a minute to swoon. Oh, need another minute to clean up that drool? Take your time. After sharing some of this Cookies and Cream Chocolate Pudding Pie with co-workers, and ultimately regretting it after eating the last slice, I decided to be selfish with this Banana Pudding Pie. Ken and I devoured this pie within three days of me making it. We kept it all to ourselves. Luckily, this pie is super easy to make so making another one really won’t take up too much time. It’s basically ready to devour in under 30 minutes. You probably have some of the ingredients on hand or can easily pick them up on your way home from insert activity here. This is another non-made-from-scratch homemade pie. I made it at home but I used prepackaged ingredients. If you turn your nose up to that, well then this pie isn’t for you. BUT, the bananas are fresh, so there’s that. If you’re a pro at making from scratch pudding and pie crusts, you could always go that route. If you do, be sure to let me know how it turns out. Ya know, sometimes I feel like one of those food snob people that shuns prepackaged foods. Because sometimes I’m like ewww gross. But other times, I’m like meh. If you’re like meh when it comes to recipes made with prepackaged ingredients, you may like these Chocolate Pudding Pies in Jars or these Mini Chocolate Bundt Cakes with Coffee Glaze. If you’re like ewww gross to recipes made with prepackaged ingredients, you may like these Chocolate Coconut Pudding Cakes or these Nutella Stuffed Peanut Butter Cookies. For those who love all things sweet, prepackaged or not, I hope you enjoy the recipe. Prepare the filling. Whisk together the 1 1/2 C milk and pudding mix. Mix in half of the cool whip. Mix in 1 C of the vanilla wafers and then the bananas. Scrape into the cooled crust. Refrigerate for 10-15 minutes or until set. Childhood recipes are always a source of inspiration in my cooking too. 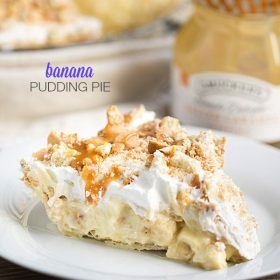 But this type of recipe, banana pudding, I have not heard from my Filipino culture, so I got excited looking and reading your post when it popped into my email.v Learning something from fellow bloggers is one of my joys in life. Thanks for sharing. Would almond milk work just as well as whole milk? I think I would keep it all to myself too! Looks great! Pre-packaged ingredients or not – this pie looks MOUTHWATERING!!! Look yummy. I love banana pudding in any way shape or form, well almost. There’s one I’d fight over at a restaurant downtown, haha. So good! Thanks for sharing & happy Thursday. Thank you, Leslie! Hope you have a great weekend! This looks heavenly! I don’t blame you for not sharing it! I remember this bad boy from instagram. I’ve been craving banana pudding like no other all summer long. Now I know what I’ll be making this weekend…. Thanks for stopping by, Graham! I hope you enjoy the recipe. Banana Pudding FTW! Loved this post, Julie! Sometimes I’m a food snob and feel like I have to try to make everything from scratch, and other times I’m totally OK with adding a few jars and packets here and there. I’m definitely not much of a pastry-maker though so I’m definitely with you on getting pre-made crusts. I love that you made this in so little time. I’m not sure what cool whip is, but now I’m thinking of all sorts of different similar pies I could make! Thanks for the idea! Hi Julie….thank you for sharing. By the way…Trader Joe’s has the best frozen pie crust. The difference is amazing in taste! Happy Summer! I love cream pies. They are popular in my family too. So this is good, otherwise I would eat the whole bloody thing myself. Yikes! I would probably use a cooked pudding package, because I like that better. Don’t ask me why—-but probably that’s leftover from my childhood taste buds. I pinned it, because easy works!!!! I don’t know if I’ve ever had the cook n serve pudding before. But now you have me wanting to try it! I need to find the patience to wait for it to set. haha. I’m like Carol, the cooked pies taste so much better, texture and flavor in my opinion. Looks like an AWESOME recipe though. Heh, I am enjoying my sweet streaks too! Funny – they are motivating me to get up early every day and exercise before work! I Love Banana Pudding! And this Banana Pie Can’t Wait To Try looks Delicious. I made this pie to take to church for a luncheon!!! It was a BIG hit, and was wonderful !!! I will make it again!!! Easy, easy too!! Thanks again !!! Do you recommend a specific crust? I would love to make this over the weekend.. Thank you!! Pillsbury crust will do just fine. I’m not about to try to make my own crust…that will probably be a disaster. LOL! Thanks alot! I am just wondering how long this pie will keep in the fridge. I of course over did our Thanksgiving desserts and have some of this pie left. I would say 3-5 days. I think we had leftovers for about 4 days as there were only two of us at my house eating it. I’m from México but we don’t have this instant vanilla pudding, but do you think i can use a box of vanilla flan? would that work the same? I’ve never used flan before so I can’t really say whether or not it would work. If you give it a try, please let me know how it turns out! :) Thank you for stopping by! does the type of milk matter? I only have fat free. I don’t think it should matter, however, I’ve never tried using fat free milk in a pudding mix. I’ve used reduced fat with success, though! vergogna chiamarlo dolce. è veleno!! Hi! I want to make this pie for a “Pi day” celebration at work! This might be a dumb question, but is it implied that you prepare the instant pudding before adding it to the recipe, or do you literally dump the powder contents in while making the pie? Thanks! Yes, you prepare it before you put it in the pie crust. The instructions for that part are located in #2 of the recipe instructions. :) Hope you enjoy the recipe! Thank you for this! I made it just as you said for a dinner party and everyone loved it. Super easy and excellent taste! My granddaughter’s husband asked for Banana Pudding tomorrow but I am going to surprise the whole bunch with this little beauty. The salted caramel sounds like such a nice touch! Thank you. You’re welcome, Janey! 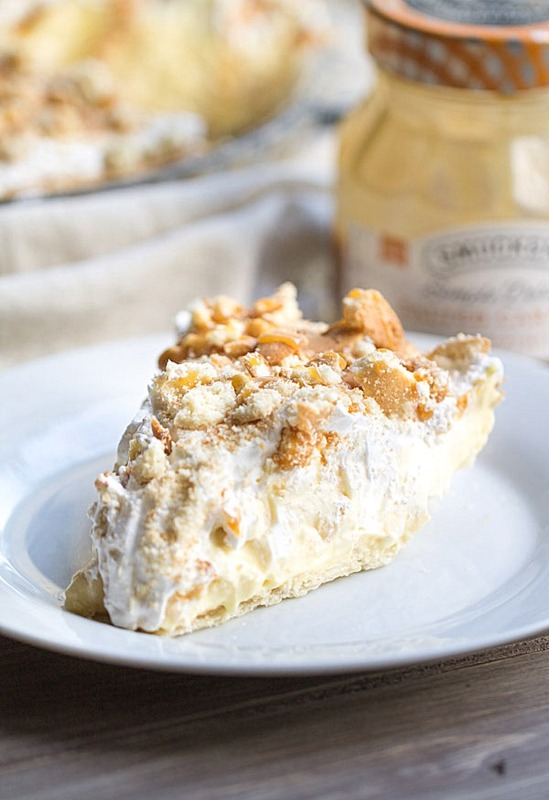 Hope you and your family enjoy the banana pudding pie! Hi! I know it’s been a while since this was posted, but I had a question. On step 2 when you combine the milk and the pudding. Are you just adding the pudding powder or have you already prepared the pudding with the 3 cups of milk called for on the box. I just don’t want to get it wrong. It looks so fantastic and I don’t want mine to not turn out. Thanks! You combine the powder and the milk. Ignore the directions from the pudding pie. :) Hope this helps! Oops, I meant ignore the directions from the pudding box! Thanks for getting back to me! Can’t wait to try it! just curious could you use banana pudding instead of vanilla or would it be too over powering? I’m so excited to make this but am unsure of the ounces of pudding mix. I have a 2.75 oz box. Is that what you mean? Hi Jan! I’m so happy that you are excited to make this. :) I used a 5.1 oz box of instant vanilla pudding in this recipe. It’s the larger box of pudding. If you only have smaller sized packs of pudding, and if you have a food scale, you could measure the mix until you have 5.1 oz. Hope this helps! Let me know if you have any other questions. Hi…thank you for the recipe.gonna try it tonight..Please ,I am confused too about the biscuits..What do you mean by vanilla wafers? Wafers are usually the fluffy long biscuits filled with a flavor..is this the one or smothering like Oreo but vanilla flavors? ? My daughter and her friend just finished making two banana pudding pie. I was going to post a picture but there is no option to do that. Thanks again for posting. I haven’t tried to make an banana pie! MUST try! thank you I love this recipe i wiil try it . Loved it! I used banana pudding mix instead of vanilla and made a vanilla waffer crust(instead of adding it to pudding mixture) So yummy! Crush 60 waffers. 1/3 c. Melted butter and a small handful white sugar. Mmmm! I am getting ready to make this in the next 10 minutes and I wanted to know if I am supposed to crumble the vanilla wafers into the mix? Or just leave them whole? I can’t wait to taste this! I have been craving banana pudding all year! Could I use a 9 In Graham Cracker Crust instead of a baked Pillsbury Pie Crust? I can’t wait to make this wonderful pie. Can you make this one day in advance of eating? Dang. I didn’t see the milk measurement because it’s not toward the top of the ingredient list and I read a comment that said to make the pudding first so I just followed the directions on the box which calls for 3 cups of milk instead of 1 1/2. Seems like it’ll still work okay, but I am worried about it setting up (hope there’s not too much liquid consistency) and now I also have a TON of pie filling leftover (I could’ve filled two). It would be really helpful to also list in the directions to only use 1 1/2 cups of milk. I’m sorry the recipe didn’t work for you but the recipe ingredients list 1 1/2 C of milk as the measurement of milk to use. In the past, I’ve made measurement mistakes when following recipes because I read through the recipe too fast. I find it helpful to read the entire recipe before attempting to make it. That said, I updated the instructions to also reflect the 1 1/2 C milk measurement. I’ll never understand why it’s called banana cream pie instead vanilla cream pie with bananas. The pudding should be banana. 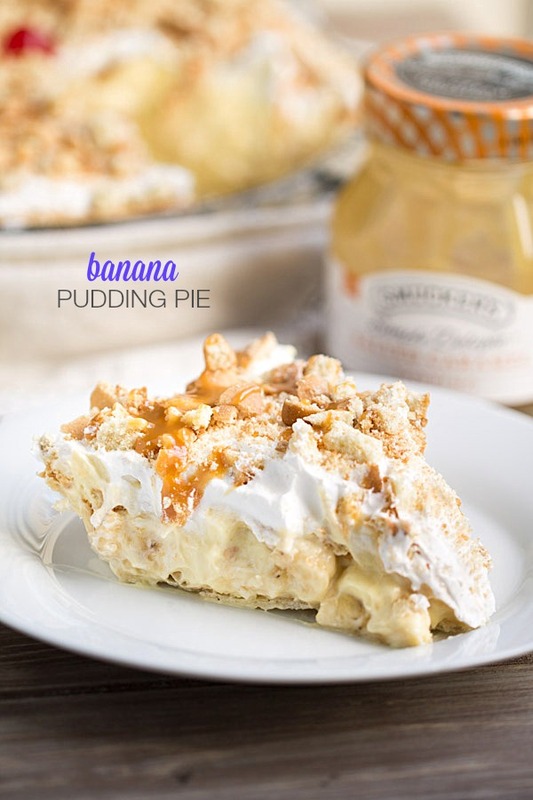 You can use banana pudding & I’ve always found that the cooked pudding is much better than instant! You can even mash bananas and use it in pudding to hey banana flavor. I prefer vanilla pudding. 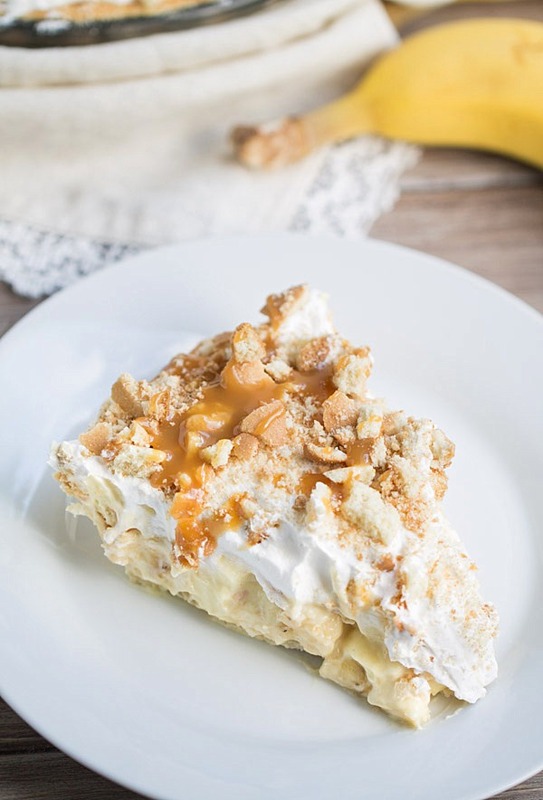 When I was growing up, my family always made banana pudding with vanilla pudding – and that’s what I based this pie off of: my family’s banana pudding. If you prefer banana flavored pudding, use the banana flavored pudding instead. ?? I am making this for Christmas Eve dinner. Should I make it the day of or can I make it the night before? You can make it the night before but just a heads up – the crust may be soggy next day. I’ve had leftovers of this pie (still taste wonderful) but the crust isn’t crisp like it is the day it’s made. Hope you enjoy the pie! Pingback: Best Ever Banana Pudding Pie | happy.harvey.home. Hi. I’m currently making this recipe for a coworker who is retiring. I don’t have time to whip it up the morning of so I was wondering if I made it tonight would the vanilla wafers and bananas still be good tomorrow (bananas not brown and vanilla wafers soggy)? Thanks! The vanilla wafers will be soft the next day. They won’t be extremely soggy but they won’t be crisp and crunchy like they are when eaten the day it’s made. The bananas will be a little brown but to help with this, you may toss them in a little lemon juice and that will help prevent them from turning brown. 10* all the way!! Omg the best and easiest ever‼️🍰 I keeping this as my go to recipe ! So yummy, I used a salted caramel to drizzle on the top… perfect !! I have made this at LEAST a dozen times and it is perfect. and SO easy. The difference is having the bananas AND vanilla wafers IN the cake vs just on the bottom or sides. Wonderful! Hi! Do you think this recipe would be freezer friendly? It looks absolutely delicious! We can’t wait to try it! I am not sure if it is freezer friendly. I don’t freeze many meals – just a personal preference. If you try freezing it, please let me know how it works for you. The recipe is there now. There was an issue with the plugin while I was trying to change to a different plugin. Apologies for the inconvenience. Why can I no longer see this recipe? This was my mothers and MIL favorite pie I make for them every year. Now i wont be able to make it because the recipe is no longer showing and states it was removed. The link for the recipe doesn’t work. I think I might cry…I found this recipe yesterday and bought everything to make it and now the recipe is not showing up. It just says Tasty Recipe ID….panic panic! Lol Any chance you can post recipe and instructions here. I am doing the Cookies and Creme Pudding Pie and the recipe is showing up for that one so I think it is just this page that is malfunctioning. Thanks so much!!! I’ve made this pie 6 times in the last month. It is a huge hit! I get so many compliments and requests for the recipe. After researching different recipes, I decided to use half banana cream half vanilla on the pudding. I use cool whip for the filling but topped it with homemade. Soooo good. I’ve been making this for Thanksgiving and Christmas for several years now. Looks fabulous, tastes fantastic. Always a family favorite. I prefer it over traditional banana pudding. You should hear the gasps when it comes out of the fridge!! Can I make this today and refrigerate overnight? Yes. The crust will not be firm and crispy next day though but the pie still tastes just as good! I made this for the first time on Thanksgiving and my family is asking for it again. It is easy-peasy and delicious.